To keep it simple, we based this run on the dimensions of an 8-foot corrugated plastic roofing panel. We built the frame out of 1-inch PVC and used 3/4-inch dowel rods to help secure it to the rabbit pen. 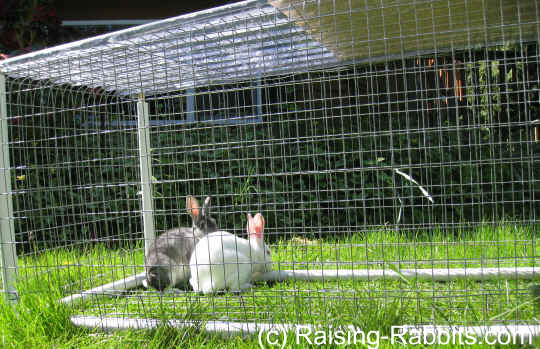 If you need help: We incorporated this rabbit run plan in greater detail into our Pet Rabbit Living Spaces e-book. We also designed a 4-foot-wide rabbit pen/run with wheels. Both run designs have been added to the DIY Livestock Rabbit Housing e-book (and they are also in Ideal DIY Rabbit Cages, of course). 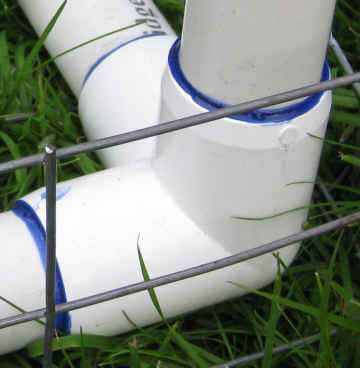 Cut PVC to lengths specified in Materials. Sand any burrs. Note: one side is taller than the other, in order to allow for easy drainage in rainy weather. Be sure that the long legs are both at a skinny end, as the corrugation runs long-wise. Also, with one end shorter, you may find it easier to access your bunnies from the short end. Bend 4 inches of the bottom, 2" x 4" wire upward, all the way around the perimeter. Clip the overlap at the corners and fasten with J-Clips. This is to add stability, give more area for fastening the side wire, and to hopefully make the rabbit run a little bit more sturdy and predator-safe. Note: if you use livestock wire [4" x 4"] you will run a huge risk of escapees, even if only on the floor. 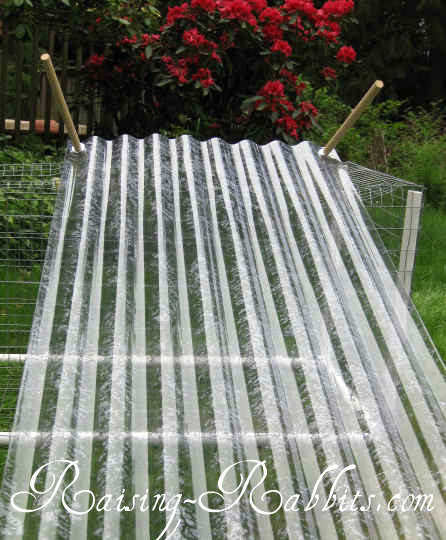 Place the PVC frame in the basket you’ve formed with the 2" x 4" wire. 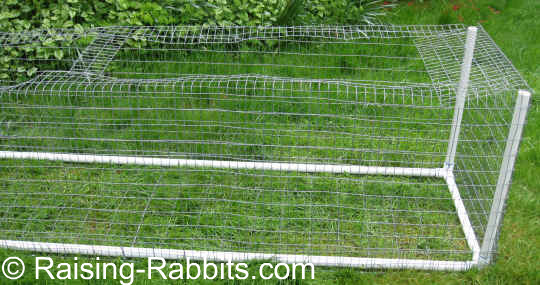 Circle the PVC rabbit run frame with 1" x 2" x 36" wire. Fasten to the 2" x 4" floor wire liberally with J-Clips, at least every 4 inches. It will be way too tall. Cut away wire at corners as shown in photo. Turn the rabbit run on its side. Place a length 2 x 2 (or 2 x 4) board long enough to describe an imaginary line drawn from the top of a 24-inch leg to the top of a 20-inch leg. The board is only to provide you a straight edge against which to easily bend the wire upward (toward the middle of the rabbit run) forming a small portion of the roof. Bend wire to 90 degrees. Bend the wire at the short ends of the rabbit run as well. From the discarded wire, cut a 4-inch wide strip to serve as a stabilizer across the top at the middle, and bend end wires to fasten tightly. See picture. The extra lengths of wire are to give stability to the corrugated plastic panel. It’d be rather wobbly without the wire to rest on. Bending it inward, will also, I hope, discourage curiosity from predators. 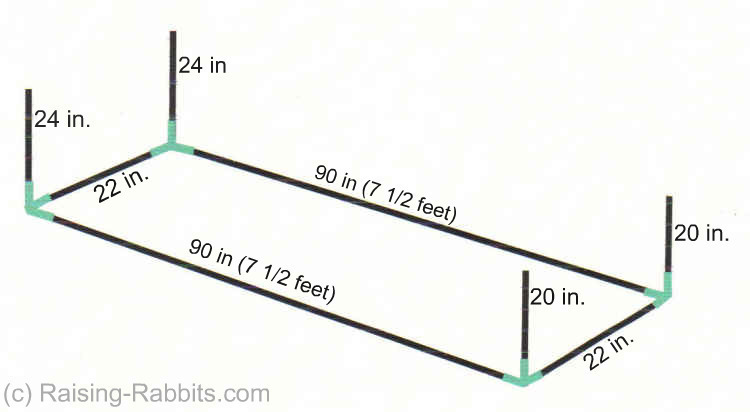 Measure the distances between the PVC legs on-center, both lengthwise and width. Use these measurements to determine where to drill 4 holes in the corrugated panel, one at each corner. If you’ve used our measurements, you should be able to drill at the juncture of a 2-inch margin from the long ends and a 1 3/8-inch margin from the sides. We got the wood screws as tight as we possibly could, but you can see that the screws still protrude a bit from the dowel so the whole assembly is floppy. Tight - but floppy. Our pilot holes could have been bigger. But, we figure it is just fine this way, as the extra play makes it very easy to insert the dowels into the PVC legs. And that is the next step - turn over the corrugated plastic so the dowels point downward and insert the dowels into the PVC legs. Having foot-long dowels should make it harder for wind to lift the roof off the rabbit run. 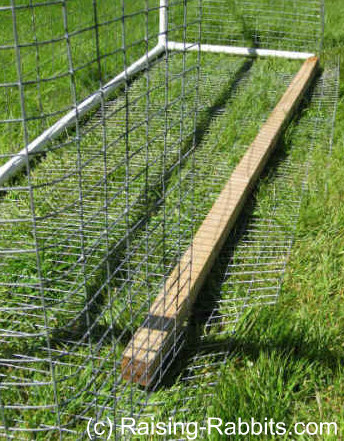 If you plan to let rabbits ‘live’ in the rabbit pen as you move it around your lawn every day, then you’ll probably need to add strapping across the top, such as bungee cords, so no curious and dexterous raccoon-hands can pry the top off for a ‘free’ meal. Provide crocks for pellets and water, or do as we do - hang a J-feeder and use a 1-gallon Edstrom water tank, valve and tubing. Since the rabbits will have access to fresh green grass, their intake of pellets will drop significantly, as will their water intake. The fresh grass will provide lots of moisture. 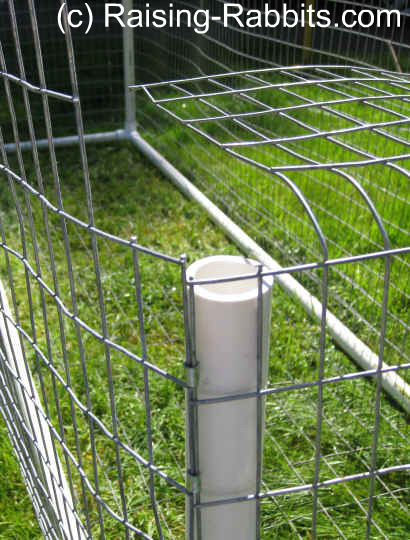 Since the PVC frame is light, you might also wish to drive tent pegs through the corners to fasten the rabbit run to the ground. Just another precaution in windy areas. THERE, we’re done! All that probably took us a few hours, including the trip to the store to purchase parts. 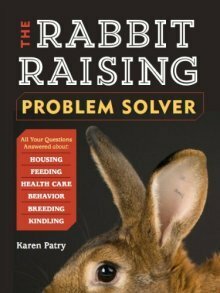 Go to World of Raising-Rabbits to check out cage-building and other rabbit husbandry e-books by Raising-Rabbits. If you'd prefer to buy a very nice rabbit pen without the effort of constructing it, here are a couple very strong runs. The bottoms are open, making it easy for rabbits to nibble grass and forages (ensure no pesticide sprays! ), but this also makes it easy for them to dig should they have a mind to do so.